Fourth of July in San Francisco is always a busy holiday. In 2019, this popular holiday lands on a Thursday and it always attracts thousands of people to the waterfront area. Other popular activities this day include biking around the city, wine tasting tours, and several other fun activities throughout the day. You can also join one of the SF Public Library's free walking tours in the morning or afternoon. The weekend before is also full of fun activities with the annual Fillmore Street Festival, a free concert in Stern Grove Park and both San Francisco Giants and Oakland Athletics baseball. The fireworks display starts shortly before 9:30pm (or once it's dark enough to start) and lasts around 30 minutes. Click here for additional tips on attending this year's fireworks display. This is where you will find tips on the best places to see the fireworks all around SF and the Bay Area. The cruises leave the Fisherman's Wharf neighborhood about an hour or more before the fireworks start. 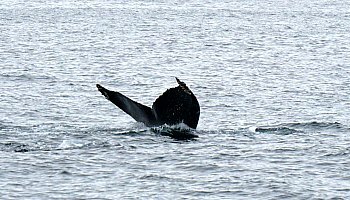 This gives the boats a chance to get to the perfect viewing point before they start. 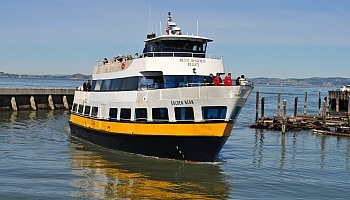 Here are the ferries scheduled so far for 2019. All cruises sell out quickly, so buy yours today! Hundreds of thousands of people watch the fireworks display off the coast of Fisherman's Wharf each year. And, many spend the day there too! 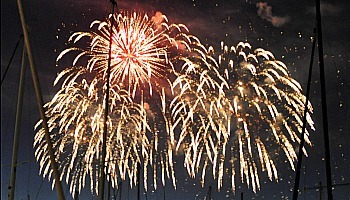 Here are some of the best activities in Fisherman's Wharf for Fourth of July in San Francisco. If you plan to head out on a cruise or a tour, these do sell out quickly, so pick up your tickets as soon as you can! 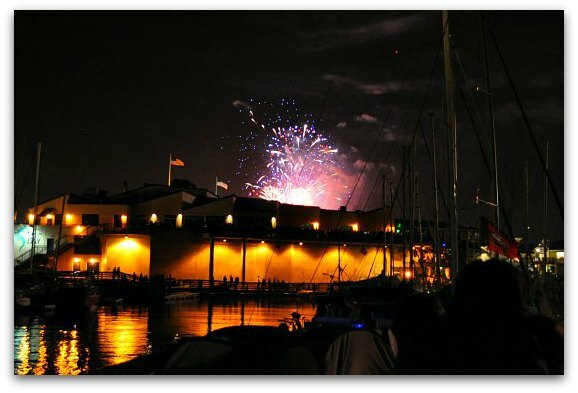 Celebrate the Day on Pier 39: Pier 39 will again host a large fourth of July celebration. All afternoon you can listen to live music and enjoy other family friendly activities. This year's events include special exhibits on the western side of the Pier. These are open starting at 11am. Enjoy live music from 5pm until 8pm. You can then watch the fireworks show from Pier 39 starting at around 9:30pm. Live Music at Aquatic Park: In addition to all the fun at Pier 39, the City and County of San Francisco is also hosting live music at Aquatic Park. This event starts at 6pm. After the live music, you will be treated to the fireworks display at 9:30pm (also courtesy of the City and County of San Francisco). Admission is free. Make sure to arrive early for your spot on the lawn. Picnics are allowed here, but alcohol is prohibited. Rocketboat: Head out on the SF Bay on a high speed adventure. The Rocketboat is a 30-minute ride that twists and turns on the water as they blast rock and roll classics. The ride is quick, but it's an experience you will never forget. Find tickets for July 4th rides. 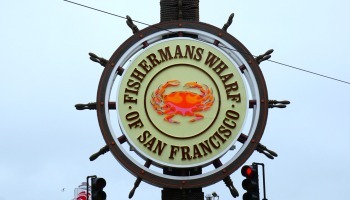 If you plan to spend your entire day in Fisherman's Wharf, you will find dozens of places to spend the night too. This district has a large concentration of hotels for every budget. Here are just a few of my top recommendations. In addition to these, I've also pulled together some additional recommendations for you here. They are organized by budget so you can quickly find one that will work for you. If you are ready to book, then click the links below to check out some of the best hotels deals in this district and all around SF. Every year, there are dozens of other fun events on Fourth of July all around the city and beyond. Here are some of the activities planned already for Fourth of July San Francisco 2019. Cruises and other tickets are selling out QUICKLY. Book your tickets today in order to secure your spot on any of these cruises or tours. Oakland A's Baseball: Celebrate Independence weekend with the American past time - baseball! The Oakland A's host the Minnesota Twins at the Oakland Coliseum. The Fourth of July game starts at 1:05pm. California Academy of Sciences: The California Academy of Sciences, our most visited museum, is now open 365 days a year! This means you can spend the day inside this interactive museum as you explore their rainforest, see a show in the planetarium, or stop by to say hi to their rare white alligator. Click here for details and where to meet for the start of the walk. Click here to visit their site to confirm each walk is still taking place. Most SF attractions stay open for their regular hours on Fourth of July San Francisco. 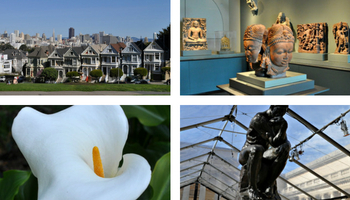 I've listed some above already and here are a few more options for you to check out throughout SF. 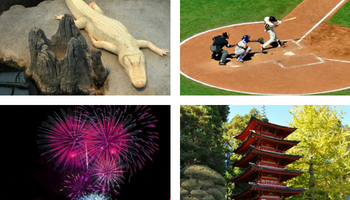 Click here for a detailed look on the hours for all of SF's top attractions on Fourth of July. There are plenty of fun things to do all around town on Fourth of July San Francisco. These are just a few of the top tours scheduled to run this holiday. All are scheduled to be complete well before the firework show in Fisherman's Wharf after the sun goes down. They will give you something fun to do as you wait for the firework show to begin! Here are some additional things to do on the days before or after Fourth of July San Francisco. SF Giants Baseball: The San Francisco Giants return home on Friday, July 5 for a three game home series against the St. Louis Cardinals. Don't miss your chance to cheer on our Giants baseball team in one of the most beautiful parks in the US. Theater Productions: This week is also full of fun theater shows. The top pick this week is Hamilton at the Orpheum Theater. It's the story Alexander Hamilton, one of our most famous founding fathers. This Broadway musical continues to get rave reviews and is a must see. In addition to the activities mentioned above for Fourth of July San Francisco, here are a few additional things to do this week. All tickets below are offered at a discount on Goldstar. They offer tours, theater, and other activity tickets at up to 50% off their full retail price. Click the links for details. 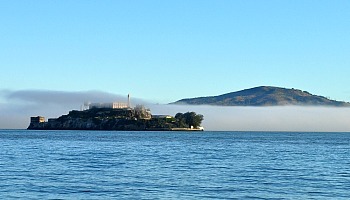 What will the weather be like during your visit for Fourth of July San Francisco? Some visitors think it is hot and sunny in San Francisco during the summer. However, the cool ocean breezes and late day fog keeps it nice and cool. Although it is usually nice and sunny during the day, you will want to bring along a light jacket or sweater for the fireworks display. As the sun sets, the cool breezes bring the temperatures down all around the city. Discover even more tips about what to wear in San Francisco in July.